I don’t know for sure what has gone wrong with JB Hifi, but if I were to take a wild stab in the dark, it would be that they can’t afford to keep the same range of DVDs they once did..
A couple of weeks ago I was in one of their stores and I was looking for something to buy. Someone like me, a fan of so many shows, this should not have been a difficult thing. However every tv show I was thinking about buying could not be found on the shelves at all. Then I started looking for some of the teevee shows I already had, and they were not there either! Or maybe there was one season out of 4 or 7 and it was never season one. This was odd because JB Hifi had long been a reliable dvd haven. 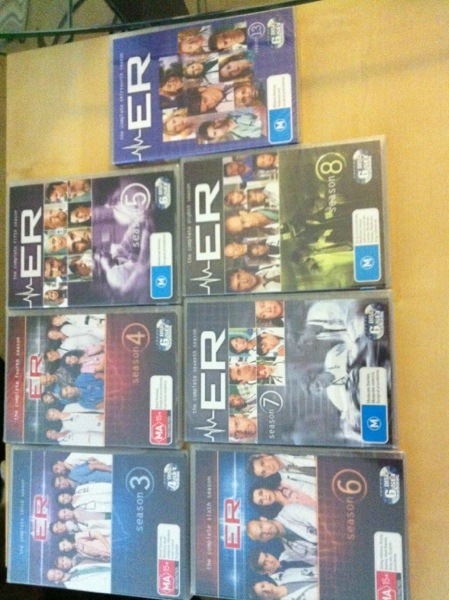 I ended up going home and re-watching ER seasons one and two. At some point the other half came in and he was looking for a dvd of his, and he ended up moving all his dvds into his room. While re-organising the shelves, we discovered I only had seasons 1, 2, 9, 10, 11, 12. So it is an hours drive to the local JB Hifi, and knowing that last time I was there they had very little of any of my shows and I know I didn’t see any ER at all, I did an online order. Some of it arrived today – I think I am still missing episode 14, and we couldn’t find episode 15 on the JB Hifi website to order at all! Their search engine is *woeful*. We ended up finding ER by accident – somehow we ended up with “E>R” in the search box, and all of the episodes (bar 15) appeared. On top of all that, they just left the box on my doorstep. Lucky they rang the doorbell or else I wouldn’t have known to look, and it would have been stolen. What kind of business in Australia allows deliveries to go out without the must be signed for sticker? How much stock must get lost just because of this? And how do they treat the people that happens to? I know what you are all thinking. Why didn’t I just download it? First up, they are $19.98 each which is relatively cheap. Second, they have special features including commentary tracks and bonus footage which I greatly enjoy. Third, I would like to own all the series I love on DVD. Old fashioned maybe, but that is the way I like it. Some of them make this very difficult – eg NYPD blue only released seasons 1-4 meaning when I wanted to watch it last year, I had no choice but to download. But if and when they release 4-12, I’ll be buying them.